Overseer Shiralas is a Dunmer who can be found in Vivec City, overseeing the construction of new cantons. She is the wife of Varona Beloren. 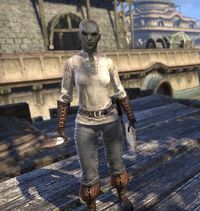 After the events in Vvardenfell, she can be encountered again in Murkmire where she is taking a vacation with her wife. Talking to her before her related quest, she'll say, "I don't know how we're going to get all this done. I miss the days when I could just request another contingent of slaves." "This project has been nothing but one disaster after another. How am I expected to get this ziggurat built on time when things constantly go wrong?" "Our Blessing Stone? Do you know what happens if we give up our Blessing Stone? Well, neither do I, but I'm sure it won't put us back on schedule or end our string of disasters. I'm not one to disagree with the Archcanon, but that's a terrible idea." Lord Vivec needs a Blessing Stone to perform a ritual. "Lord Vivec? Why didn't you say so? But I'll need your help before I can turn over the Blessing Stone. The passage that leads to the consecration chamber collapsed, trapping some of my workers. If you can clear the way, you can borrow the stone." Talking to her immediately after this, she repeats your task: "Clear the passage and rescue my workers and you can borrow the Blessing Stone. Just let Lord Vivec know that we'll need it back to finish building this part of the city." "Red Mountain erupting caused major setbacks. Between the lost workers and the damaged stone, it will be years before everything is done." "Thank the Three! I'm grateful Varona wasn't harmed when Baar Dau dropped." "Hey, I know you! You borrowed a Blessing Stone from my construction site in Vivec City! And stopped the moonlet from falling out of the sky! Now I feel kind of embarrassed. My current problem isn't anywhere near as important as saving a Living God." "Varona and her beloved pet, Drooler, went for a walk in the swamp hours ago and they still haven't returned. My wife can take care of herself, but she's as unfamiliar with this terrain as I am. I fear the worst may have happened." Do you know if Varona had a destination in mind when she left? "Varona saw some ancient Argonian stonework out in the swamp. She loves to study the techniques of long-dead masons. Use this whistle and Drooler should come running. If you pet him and tell him he's a good boy, he'll lead you directly to Varona." I'll try to find Varona and Drooler. "Drooler loves that whistle. He comes running whenever we blow it. I'm sure Varona just got caught up examining an interesting piece of carved stone, but I appreciate you going to check on her. I'll just wait here in case they return." Tell me more about your pet, Drooler. "Drooler's our bantam guar. Cute little slobberer was a marriage gift, and he's been with us ever since. He's more attached to Varona than to me, truth be told, and she's trained him well. Just blow the whistle and he'll come running." What are you and Varona doing in Murkmire? "Varona constantly complains that we never take a vacation. So, when the opportunity presented itself, I set up this trip to visit Murkmire. She was certainly surprised, but I get the feeling she was hoping for somewhere with a bit less mud." Why does Varona have an interest in ancient stonework? "We met on one of my construction sites. I was just an assistant overseer on that project and Varona was one of our stone masons. She's really good at her craft. Whenever she gets the chance, she loves to learn new techniques for working stone." "Same as always, thanks to you. Baar Dau hangs peacefully above the city, Lord Vivec writes and sings in his palace, and our new archcanon has adapted well to his responsibilities. In fact, things are so quiet that we decided to take this trip." 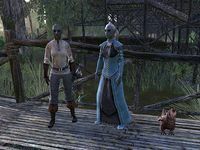 Shiralas, Varona and Drooler in Murkmire. "Varona made it back safely. And Drooler, too! Thanks for going into the swamp to find them. I really appreciate your help. In the meantime, I'm going to pamper my wife and help her forget her ordeal. Nothing but the best for Varona!" What will the two of you do now? "Complete our vacation, of course! But no more wandering around on our own. I'm not letting Varona out of my sight for the rest of this trip! Then it's back to Vivec City. Those cantons aren't going to finish building themselves, you know." This page was last modified on 12 February 2019, at 00:39.